This is the second in this series, having a more in-depth look at our winning competition image, and the photographer who captured it. The image shows a girl with expressive eyes, who seems to be lying down outside, with hands cupping her face and her own hand holding onto one hand. The image was taken by Desislava at home, which was lovely for the girl in the portrait as there were no onlookers and it was relatively easy to capture as the lighting was perfect at that time. The bit that took time, was the processing, as is often the case. 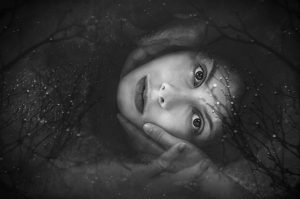 Desislava has cleverly combined the portrait with images of water and tree branches, to give the stunning overall effect, which won her the first prize in our competition! Desislava was looking for a hobby after the birth of her second child, and discovered both a love for, and a talent for photography. She has a natural instinct for a good image and the best piece of advice she was given as a photographer, was that it is not necessary to follow the rules – we like that! Desislava would love the opportunity to travel and visit other countries and cultures. She doesn’t have a particular place that she would like to visit, as she hasn’t travelled a great deal so far! When asked where her next photography trip might be to, she replied that as the Summer is here, she will probably head for the sea and take some beautiful shots of the sea-nery! Thank you Desislava, for sharing your thoughts, ideas and tips with us! And should you ever travel this far, we would love to see the images you capture!